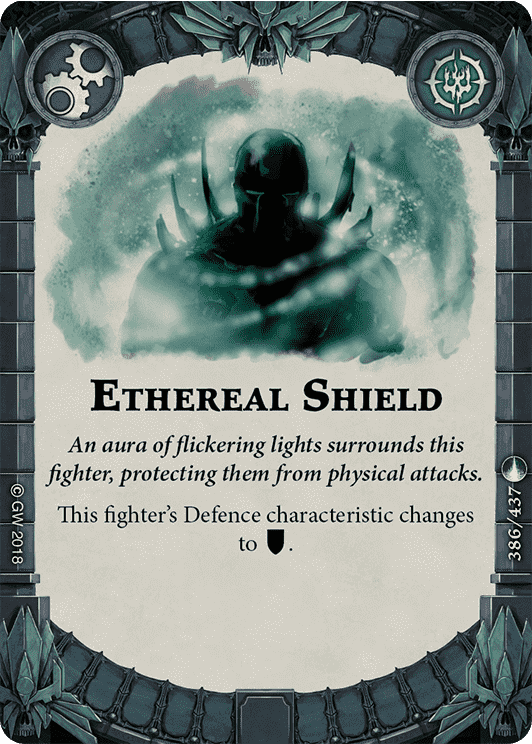 Ethereal Shield only benefits warbands with fighters who use dodge on defense. The following is a representation of the fighters in each warband that use dodge; each parenthetical represents a single fighter - the numbers represent the number of defense dice they roll for dodge before and after inspiration. Obviously, Sigmar warbands, Orcs, and Dwarves should not run this upgrade. Magore's Fiends can probably pass, unless their strategy is entirely dependent on the dog. The remaining warbands all have plenty of fighters who use dodge to consider running Ethereal Shield. The pure numbers can be found in the chart below. 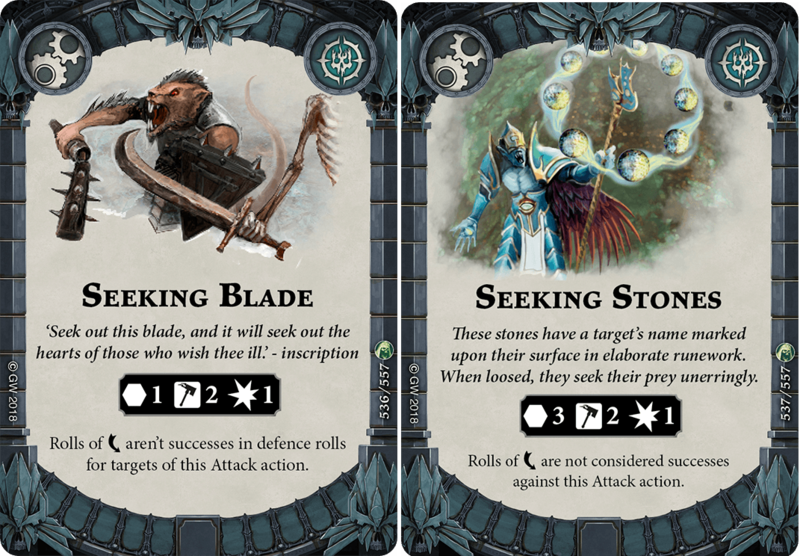 The more dice you roll on defense, the better Ethereal Shield becomes for you. 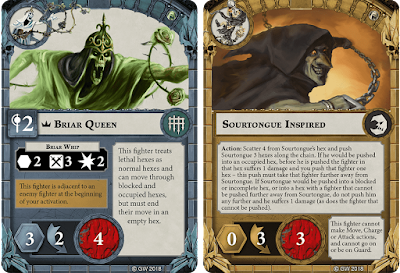 Ideally, attach the upgrade to the fighter that rolls the highest number of dice. 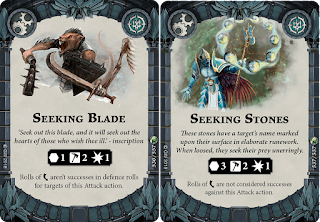 Garrek's Reavers and Sepulchral Gaurd benefit the least from the step up from Dodge to Block, while units with 2 dodge dice uninspired are great targets for Ethereal Shield (as is Inspired Sourtongue!). Cleave turns Ethereal Shield from an upgrade into a downgrade. Instead of becoming harder to hit, your fighter becomes easier to hit. Essentially, your fighter will fail to defend about twice as many successful cleave attacks with Ethereal Shield than she would have without it. There’s also a psychological factor, as rolling a “success” and still failing feels bad, man. However, this actually is the result of a mismanagement of expectations. If (WHEN) you do get cleaved with Ethereal Shield and roll up Blocks, just try to remember that those “successes” would not have been successful without Ethereal Shield either. The only result that would have counted as a success without the upgrade but not with it is a dodge icon. Nonetheless, if you anticipate playing against a lot of enemies with cleave, Ethereal Shield’s value drops. Seeking weapons are relatively new, and the meta has not adopted them yet. However, should they become popular, Ethereal Shield rises in value. - The extra die allows for a higher total number of successes. If your opponent is rolling more attack dice than you are defense (as they usually will be) they have a chance to lock you out of normal defenses by rolling more successes than you are rolling dice. In this case, only a critical results in successful defense. Acrobatic increases the number of dice you roll, reducing the number of times this situation occurs. - The extra die increases your chances of rolling at least 1 critical. This benefit is also best seen when the opponent rolls more dice than you. A large number of successes or a single critical by the opponent forces you to roll a critical to defend. Acrobatic increases the likelihood of succeeding in this situation, where Ethereal Shield doesn’t. - The extra die benefits from other effects that increase success chance, such as Guard and Support. An Acrobatic Fighter with Support succeeds at the same rate as an Ethereal Shield fighter without it, but with an extra die to roll. 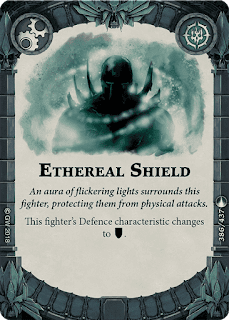 However, if the Ethereal Shield fighter has support, they still generate raw successes at a greater rate than the Acrobatic Fighter in all situations except 1 die defense. (See here for numbers). 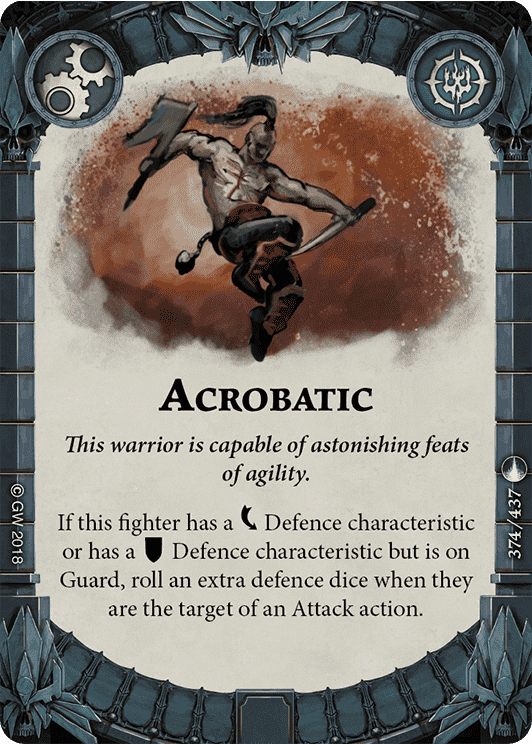 Being on Guard, on the other hand, equalizes success chance for the two fighters, making the benefit from Acrobatic's extra die much stronger. If you go on guard a lot, play Acrobatic instead. Note that you could equip both of these cards to the same fighter, but they will then only gain the benefit of Acrobatic when on Guard. rate. Units that roll lots of dice benefit more from it than those that roll fewer dice. popular as more dodge-heavy warbands are released, Ethereal Shield becomes better. Acrobatic, but there are times when Acrobatic is a better choice.